Music From Japan began their 23rd Season with a concert at the Freer Gallery of Art at the Smithsonian Institution in Washington, DC. Reiko Kimura performed on 13 and 20 string Kotos. The pieces performed were a mix of traditional and more recent pieces from the 1970s. 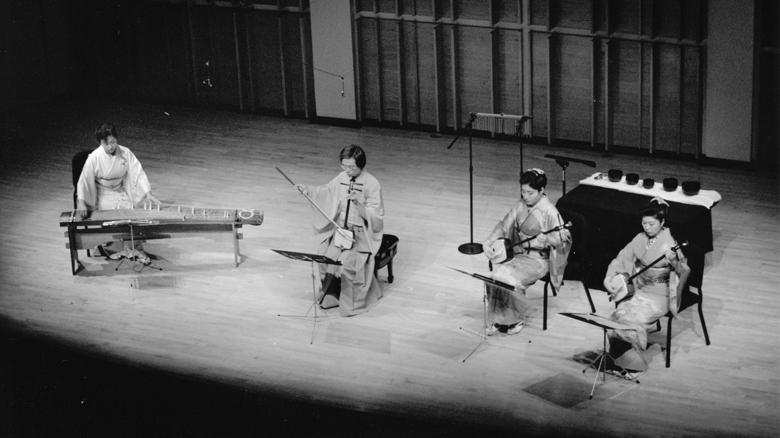 For the 1998 Festival, which took place on January 17th and 18th, Music From Japan featured the “Music and Life of Shin-ichiro Ikebe” with a lecture and performances of several of his works. Bivalence, a work for two violins written specially for the concert, was commissioned by MFJ. The second day of the festival featured the Keiji Azechi Kokyu Ensemble. The evening of the 18th was concluded with a lecture, musical presentation, and video screening honoring the work of Toshiro Mayuzumi who had passed away the previous April. After the New York festivities, MFJ brought the Keiji Azechi Kokyu Ensemble to perform at the Pacific Asia Museum in Pasadena, California on January 21st.